As we saw in the previous tutorial, the easiest way to add a contact to Hotmail is through an email your received from that person, or by sending an email for the first time to a person you want in your address book (please see adding a sender as Hotmail contact). Creating new Hotmail contacts from email recipients is discussed later in this tutorial). But Hotmail also lets you create contacts "from scratch", even without receiving or sending an email from/to the contact-to-be. This tutorial shows you how. Click on the New menu, right below the Windows Live button; then click on Contact. This action will bring you to the Edit contact details screen; by default only the essential contact fields are displayed. Hotmail Tip: The Nickname field is more important than it looks. By providing a nickname for your Hotmail contacts, you can enter a nickname (vs. email address) in the To, Cc, or Bcc email fields to save you some typing! 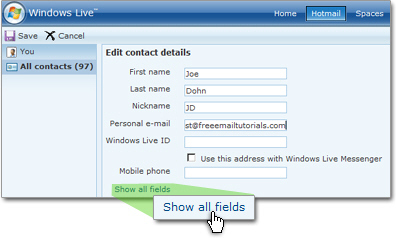 Notice the Show all fields link; clicking it will display all the fields available to a Hotmail contact. If you have entered enough information for your new contact, simply click the Save button; Hotmail will add the new contact and display a "summary card." Your new contact will now be available in Hotmail's email address auto-completion feature, the new email's contact picker (screenshot), and of course your contact list. This nicely leads us into the next tutorial, where you learn to edit your contacts' information. To add the selected email recipient as new contact, optionally enter a First Name and Last Name in the text fields, and click the Add to contacts button. If you did not enter a first and last name, Hotmail will simply keep track of this contact under his or her email address. After adding the new contact, Hotmail will bring you back to your Inbox. To add more information about the contact you just created, follow the instructions outlined in our Editing your Hotmail contacts tutorial.